68 • May 2018 • S I G N & D I G I T A L G R A P H I C S ARCHITECTURAL AND ENVIRONMENTAL where the clients stamp information, and often these can be prefinished .040 black aluminum. To remove the black coating sufficiently, the laser may have to go over it twice, but the final result is quite good and a laser requires little baby sitting. Other tags, made the same way, may have generic information, and we are basically producing very permanent labels that will far outlast any type of printed tag. These are good jobs, and generally for the afore mentioned advan- tages, that is they are easily produced and have a high likelihood of repeatability. We are fortunate to be connected to a company that has some CNC cutting equipment, so coming up with blanks, tags of any shape, size, hole pattern, or configuration is relatively easy and fast, but sign makers in most markets will be able to find a vendor who will be glad to cut thin items like these, especially if you can set up a cut file they can import easily. Most vendors can work from a stan- dard vectored file (.ai, .eps, .pdf), or cer- tainly CAD (.dxf, .dwg) if one can be pro- vided. It may be best to provide the blank metal material if they don't stock what is specified by the client. And perhaps the most important aspects of building a good relationship with a local CNC cut- ting service, is to allow a decent amount of time to get your work done, and always pay for your work on the spot. The bottom line, and that is what we need to watch, is that in most areas there are local manufacturers who need this kind of work, and may not know you can help them with it in their own neighborhood. Some marketing may be required, and a little practice, but over time a healthy and profitable business can be built up catering to these indus- trial clients, who may well become some of your best laser customers, and possibly your best and most profitable customers period. 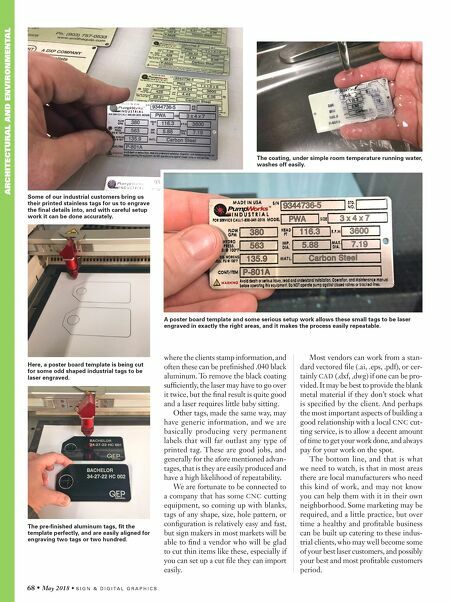 Some of our industrial customers bring us their printed stainless tags for us to engrave the final details into, and with careful setup work it can be done accurately. The coating, under simple room temperature running water, washes off easily. 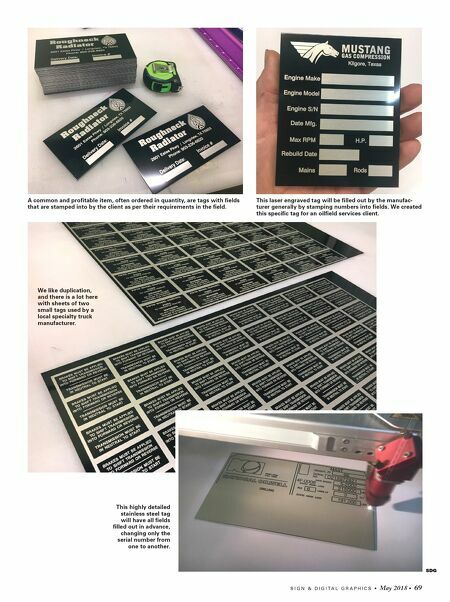 A poster board template and some serious setup work allows these small tags to be laser engraved in exactly the right areas, and it makes the process easily repeatable. Here, a poster board template is being cut for some odd shaped industrial tags to be laser engraved. The pre-finished aluminum tags, fit the template perfectly, and are easily aligned for engraving two tags or two hundred.